One of my favorite things about the warmer weather is everyone starts blogging an abundance of burgers and other grilled sandwiches. Since I’m typically too lazy to walk down three flights of steps and around the building carrying food, we rarely ever use the grills provided by the apartment complex and opt to use the Griddler instead. I try to vary up my grilled sandwiches since its not all that healthy to eat so much ground beef. Tom gets easily tired of ground turkey and I can rarely find ground chicken, so that usually isn’t an option. 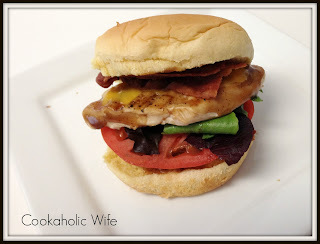 When I saw this recipe called for a chicken breast, I was all over it. I even rearranged the menu I had initially planned on just to include it. Now that’s a dedication to burgers and sandwiches, eh? 1. Preheat a grill to high. 2. Season both sides of the chicken breast with salt and pepper. 3. Drizzle the olive oil over the grill and place the chicken breasts on it. Cook for 3-5 minutes per side or until cooked through. Brush liberally with BBQ sauce. 4. Add the cheese slices on top of the chicken and allow to melt. 5. Assemble the sandwich by placing a piece of bacon (broken in half) on the bottom, followed by the lettuce. Top with the chicken and tomato slice and another piece of bacon. I opted not to go with the mashed avocado that Sarah used on her burgers, but I think I should have. I really enjoyed the burger as is, but Tom who won’t put lettuce or tomato on a burger needed more than just BBQ sauce for flavor. And yes, the strange husband who doesn’t eat most fruits and vegetables would have been completely content with a mashed avocado/sauce on his burger. Mmmmmmm! I could do this any day. All those ingredients are on hand. BBQ saice is a great flavor enhancer for the chicken. Thanks for sharing. It's funny – when it comes to burgers, I automatically think beef… and I should do grilled chicken sandwiches more often! These looks fantastic and with bacon, cheese & BBQ sauce, you can't go wrong!